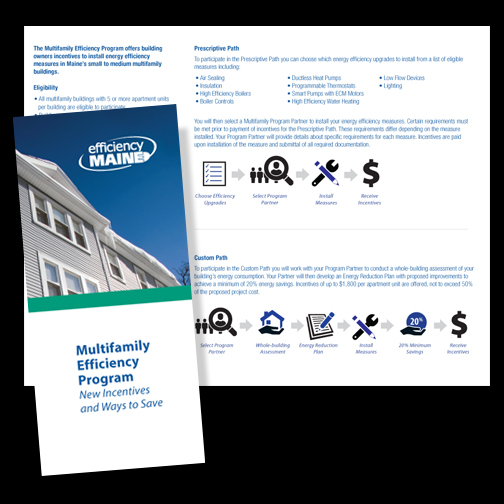 In January 2014 Efficiency Maine launched a new phase of the Multifamily Efficiency Program, offering multifamily building owners additional incentives and new ways to save. To educate participants about the new Prescriptive and Custom Path options, Vreeland created graphics that explain at a glance the steps needed to receive incentives for each of the two paths. Visual and highly readable, the graphics were added to the Efficiency Maine website and also included in multifamily program brochures and event marketing mailers.